I think I will wait till Tuesday next week to do the monster round up. Plenty more were posted since my post yesterday. So 17 18 19 22! 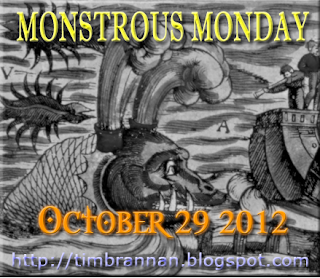 total entries for the first unofficial Monster Monday! Not too bad really! Can't wait to see what everyone is doing next week. I also managed to get one up, The Faceless, over at the Lich House. I also had one up (The Eye Imp) yesterday morning, at the Dwarven Stronghold. I slacked off this week. Ah well, just all the more impetus to get one in next week I suppose. We did a different critter for Labyrinth Lord as part of the bloghop in addition to the Mutant Monday thing. We'll probably do two critters every Monday, one for LL and one for Mutant Future.